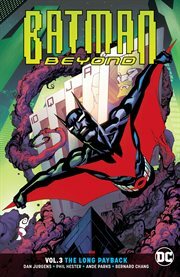 The item Batman beyond, Volume 3, issue 13-19, The long payback, Dan Jurgens, Bernard Chang, writers ; Phil Hester, Bernard Chang, pencils ; Ande Parks, Bernard Chang, inks ; Michael Spicer, Marcelo Maiolo, colorists ; Travis Lanham, letterers ; Bernard Chang & Marcelo Maiolo, collection cover artists, (electronic resource) represents a specific, individual, material embodiment of a distinct intellectual or artistic creation found in Kent District Library. Terry McGinnis has returned to Neo-Gotham. The mantle of the Bat is his to claim. There's just one thing standing in his way: everything. An entire legion of the deadliest enemies this brave young Batman has ever faced awaits the returning hero, determined to destroy him before he can ever take to the Gotham skies again. Street to street, corner to corner, building to building: Terry will be forced to wage war for every foot of ground in order to reclaim his city and his legacy. His incredible new Batsuit can't save him. His mentor, Bruce Wayne, can't protect him. His allies have no chance to assist him.This is a one-man war for the soul of a city. And there can be only one winner¿ The fight of Terry McGinnis's life begins - and ends? - in Batman Beyond Vol. 3: The Long Payback, from the creative team of Dan Jurgens and Bernard Chang. It's a non-stop action tour-deforce for one of the most beloved heroes in the DC Multiverse!